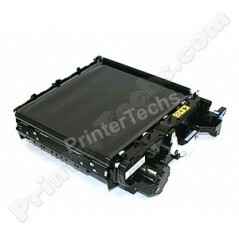 HP Laserjet Transfer Kit RM1-2759, sometimes called an electronic transfer belt (ETB) assembly. This model is for the non-duplexing printers only. If have a duplexing version of the printer, you need to order the RM1-2752. Duplexing printers have a 'D' in the model number, for example Laserjet 3600DN has duplexing and networking, the 3600N just has networking and no duplexing. HP Color LaserJet CP3505 series (non-duplexing).